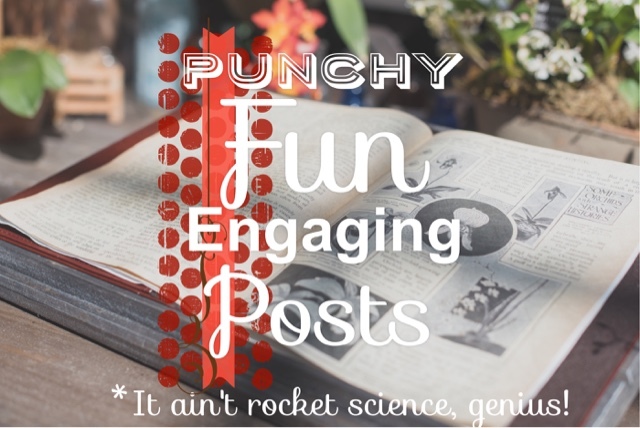 Awesome blog posts don't just happen. I've heard good things about PicMonkey, which includes many of the same features and it's free. Some readers won't get past boring, off-putting titles. When crafting a title, think in terms of promotion. What do you want readers to attend to most? Title your post accordingly. Also, be sure to deliver on any promises made to the reader. Annoyed readers don't stick around. Shocker! The internet closes the gap between celebs and Joe Shmoe. We may as well encourage audience participation and close that gap a little more, right? We can invite readers to comment, share their expertise, and give their opinions or preferences on the issues we present. Did you think about the fact that you're someone's favorite writer? If you've ever seen the sparkle in someone's eye after they read your book, that's what it means! You can never look too brilliant! Any other tips you'd mention to the blogosphere, my dears? I'd love more input on the subject. Leave me a comment below! Good points! I am the worst about going on and on in my blog posts (at least I feel like I am)...can you tell me where you get your cute editor hat? I think I totally need one ;) and thanks for the mention, you're a doll! Big thanks for the free photos links! I see you have deemed me a Master at Work, Sarah, and I am both humbled and honored!!! Thank you. Your roundup of tips here is masterful as well. Here's a tip I'll add for the image-stymied…when you need to interrupt the blah-blah, use a call-out (read-out, pull-quote)—most templates offer a pre-styled format using the giant quotes symbol. Which you can, of course, tweak. PRO TIP: Make it pithy and under 100 characters, and turn it into a tweet-able quote using ClickToTweet.com (free if you don't care about tracking results). Thanks again. Nicely done, Sarah! Thanks, Jann! Always inspired by you, my dear. I'll have to try that site too! Unsplash photos are great, and there are some fantastic ones at Gratisography - including a guy in a teddy suit coming out of a portable toilet. If that's not an excuse for an interesting blog post I don't know what is! Ooh! I'll have to try out Gratisography...I wanna see that dude in the teddy suit! :) Thanks for dropping by.